I want thank everyone who commented on my Talk it Out Tuesday post. I've read all your comments, and I'll be replying to them soon. I just haven't had time to do that yet, but I will! 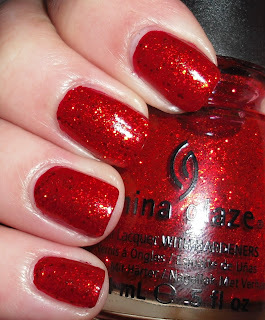 Today, I have for you one of the China Glaze holiday polishes. Ring in the Red is a mix of different sized red glitters in a red sheer base. You could do this 3 coats on it's own, but it does not have vibrancy it would as it does when it is layered. It really is a bit sheer and the red base does not have great pigmentation. I took this advice from Jen at The PolishAholic. That all being said, I absolutely love this layered. I'm not much for layering anymore, but this is so worth it. If you're a red glitter fan you will not be disappointed. This is red blingy-tastic-ness. It glitters, it glows, it looks like Jessica Rabbit's dress. Can you tell I love red glitter? Can't go wrong with a blingy red glitter! This one is really pretty - perfect for the holidays. Ooh, pretty! It's very perfect for the holidays. I haven't tried this out yet either. Hmmmm yes this does look best layered <3. Very pretty! I've always loved red glitters too and this one is super pretty! My Sally's is pretty lame about getting new collections in so they probably won't get it; but this looks like it would be worth ordering online. Great pics!